Thank you for entering the Design a Bag Competition! 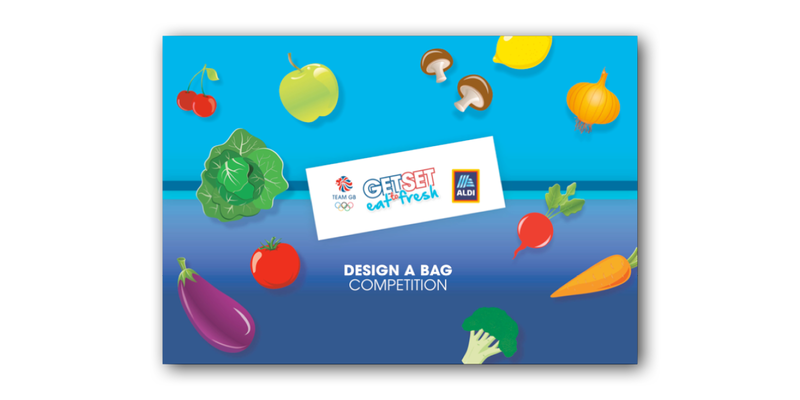 Aldi and Team GB challenged young people aged 5–14 in England, Wales and Scotland to get creative and design a Bag for Life that will inspire others to 'eat fresh'. The competition closed for entries on Friday 4 May 2018, so a big thank you to everyone who took part – we have been overwhelmed by the number of entries! 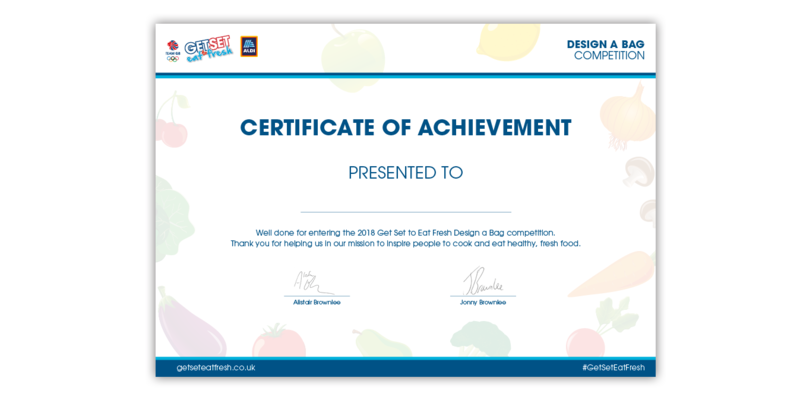 After being inundated with over 30,000 eye-catching and innovative designs, two joint winners of the ‘Design a Bag’ competition have been announced by Olympic medallists, Alistair and Jonny Brownlee. Check out the community section to take a look at the winning designs and find out the names of our shortlisted schools. Congratulations to our winners, shortlisted entries and everyone who created a design! Thank you to everyone who took part, we loved seeing your entries. Watch our Design a Bag film. What do you have to do to enter the competition? List three different things that the athletes included in their designs. Which design did you like the most? Why? Which design did you think was the most eye-catching, and why do you think this? Which design would encourage you to eat more healthy, fresh food? Introduce the Design a Bag competition with the Competition Introduction presentation, which includes optional classroom activities exploring sustainability, healthy eating and design. Why use a Bag for Life? Explore the problem with plastic, introduce the concept of Bags for Life and test the properties of different bags. Why should we eat fresh fruit and vegetables? Play the ‘Odd one out’ game, take a healthy eating quiz and explore the views of young people on fruit and vegetables. How can we create an eye-catching design? Interview each other about fruit and vegetables, review sample designs, generate quick ideas and discuss the judging criteria. Why use a Bag for Life? Why should we eat fresh fruit and vegetables? How can we inspire others to eat well? How can we create an eye-catching design? The problem with plastic, properties of different bags and the benefits of a bag for life. The benefits of eating fruit and vegetables and what other young people think about eating healthy food. Ways of generating creative ideas and incorporating feedback to create an eye-catching design. Have a question? Try our Get Set to Eat Fresh frequently asked questions to find out more. 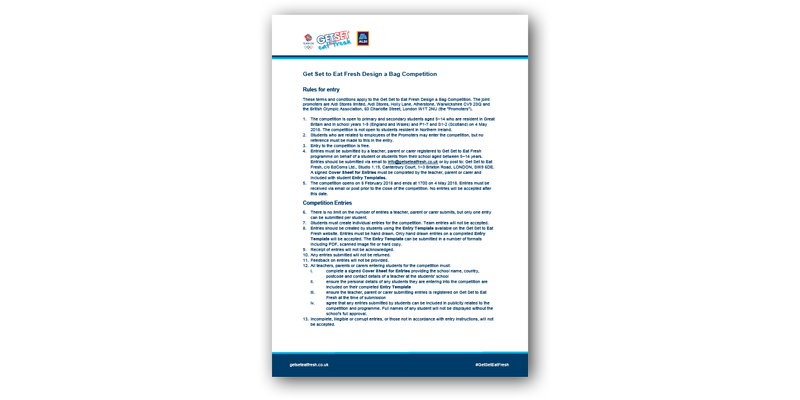 Introduce the competition with sustainability, healthy eating and design activities. Download this certificate to reward students for completing their entries. 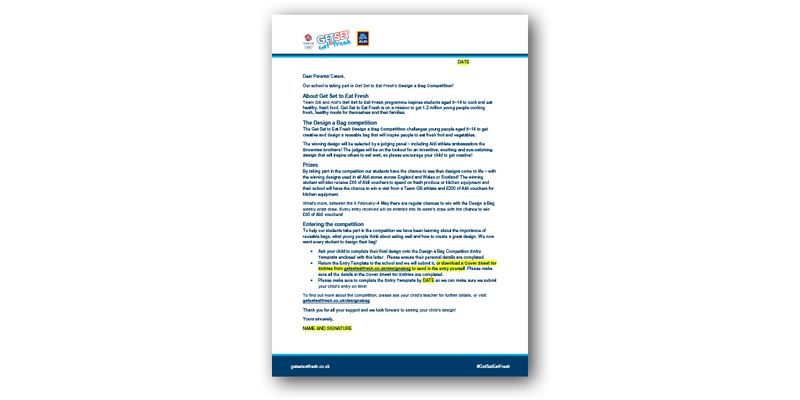 Adapt and send this letter to parents/carers to share information about the competition. Terms and Conditions for the Design a Bag competition.